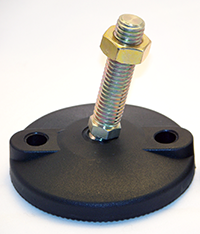 The IEC Nylon Base Metric Swivel Stud Leveler with Rubber Pad available in steel and stainless steel is ideal for medium-duty load requirements. Seven (7) base sizes up to 10" with 15 degree swivel supporting loads to 3,000 lbs. Steel stud has trivalent zinc, yellow chromate finish.